One day after the International League revealed its All-Star roster, a list littered with top prospects and Minor League veterans enjoying strong seasons, the Pacific Coast League made its own statement. 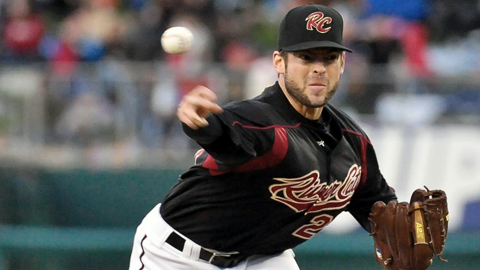 It was announced Thursday that Sacramento River Cats starting pitcher Graham Godfrey will take the ball first when the two leagues play the annual Triple-A exhibition on July 11 in Buffalo, N.Y. Godfrey is 7-0 with a 2.11 ERA in 11 starts for the Cats; this is his third season pitching for the Oakland A's top affiliate. The PCL squad comprises 30 total ballplayers: 13 "elected" by club managers and general managers, media members and through online fan voting; 17 "selected" by the league office; and at least one from each of the 16 clubs. The Omaha Storm Chasers, Albuquerque Isotopes and Reno Aces each send a game-high four players to participate. Among the Aces are starting infielders Jake Elmore and Ryan Wheeler, who lead the circuit in batting (.390) and RBIs (72) respectively. Also featured will be potential star-in-the-making Wil Myers. MLB.com's No. 14 overall prospect leads the Minors with 25 home runs; he has hit 12 since joining the Storm Chasers. Oklahoma City RedHawks veteran baseman Mike Hessman, who is 34 and a dozen years older than Myers, leads the PCL with 23 long balls and will start at first base. * indicates a selection via club managers and general managers, media members and through online fan voting. ** Andrew Brown (Colorado Springs, OF), Barret Browning (Memphis, LHP) and Luis Cruz (INF, Albuquerque) have been replaced by Dickson and McBride. Brown and Cruz were elected. Landon Powell (Oklahoma State, C) and Heath Hembree (Fresno, RHP) will not play and will not be replaced.